Download "Stakeholder s Report. 2525 SW 75 th Ave Miami, Florida 33155 305.262.6800 www.westgablesrehabhospital.com"
2 PROFILE REPORT For more than 25 years, West Gables Rehabilitation Hospital has made a mission of helping patients reach their functional goals, while providing the highest level of post-acute medical care in a caring and culturally sensitive environment. West Gables is devoted to the rehabilitation of patients with various disorders and conditions such as;, Amputation, Brain Injury, Neurological disorders, Spinal Cord Injury, Orthopedic and Musculoskeletal conditions. Additionally, our specialized rehabilitation programs are designed to meet the needs of individuals who have a broad range of acute and/or chronic illness that cause temporary or permanent disability. Our multi-disciplinary team approach is centered on a dedicated staff of Physicians; Rehabilitation Nurses; Physical, Occupational and Respiratory Therapists; Speech-Language Pathologists; Neuropsychologists; Case Managers; Nutritionists; Pharmacists; and other support personnel, who through the delivery of highly integrated and individualized programs of care, support patient recovery and goal attainment. 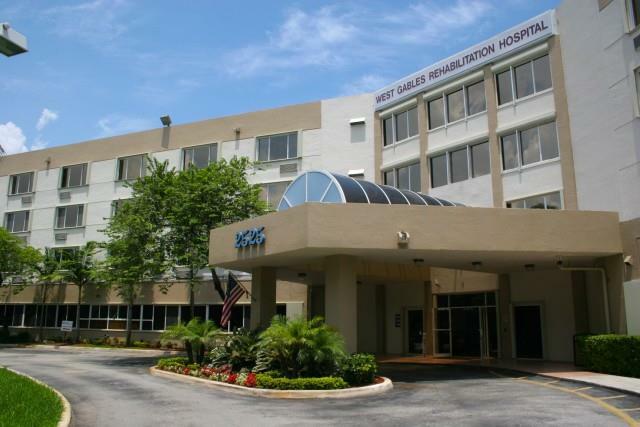 West Gables Rehabilitation Hospital provides both Inpatient and Outpatient services. Our Inpatient rehabilitation program offers patients at least three hours of skilled rehabilitation services (physical, occupational and speech therapy) five days a week and additional therapy on the sixth and seventh day based on individual needs with the overall goal of assisting our patients transition from a hospital setting back into the community. Our Outpatient rehabilitation program also offers an intensive rehabilitation program with physical, occupational and speech therapy services. Sessions are at least 45 minutes in duration and are scheduled based on the patient s functional needs. West Gables Rehabilitation Hospital is a CARF accredited hospital which features a certified Inpatient and Outpatient Specialty Program. The mission of the West Gables Rehabilitation Hospital s Program is to provide the highest level of care for our stroke patients by utilizing an interdisciplinary patient-family centered approach that challenges the patient to regain a sense of self. This mission is observed from the time of the initial assessment in the inpatient rehabilitation department through long term follow-up in the community, which may or may not include our out-patient services. West Gables Rehabilitation Hospital s staff is specialized in treating patients with stroke to challenge them to utilize their affected side after a stroke and thus facilitating recovery as opposed to compensation. To assist our patients and their families as well our general community, the Program offers multiple resources along with the skilled therapy. The resources include a weekly Orientation program offered in English and Spanish, a monthly bilingual Support Group as well as a bilingual monthly open Q&A session with our Medical Director, Dr. Brad Herskowitz. CHARACTERISTICS OF PERSON SERVED INPATIENT REHABILITATION In 212, West Gables Rehabilitation Hospital provided services to a total of 1,494 individuals. Although, the majority of our patient population is from the South Florida region, we nevertheless provided services to patients from Washington DC, South Carolina, Georgia, Puerto Rico and New Jersey. The age of our patient population ranged between 23 to 13 years old; with an average age of The average Gender Split of our patients was 35.21% Male and 64.79% Females. UW Hospital and Clinics (UWHC) Acute Rehabilitation served 358 individuals between January 2011 and December 2011. SUNNYVIEW REHABILITATION HOSPITAL Sunnyview Rehabilitation Hospital Where you go for rehabilitation does make a difference Rehabilitation is among the most complex and specialized fields in all of medicine. ACUTE INPATIENT REHABILITATION 2013 ANNUAL REPORT INTRODUCTION It is my privilege to present the 2013 Annual Report for Regions Hospital Rehabilitation Institute s acute inpatient rehabilitation services. 2014 Annual Report. HHCRehabNetwork.org. Home Office: 181 Patricia M. Genova Drive Newington, CT 06111 860.696.2500 tel 860.696. INITIAL ANALYSIS OF NEWLY ADDED DATA ITEMS. DO THEY PROVIDE INSIGHTS OF VALUE?